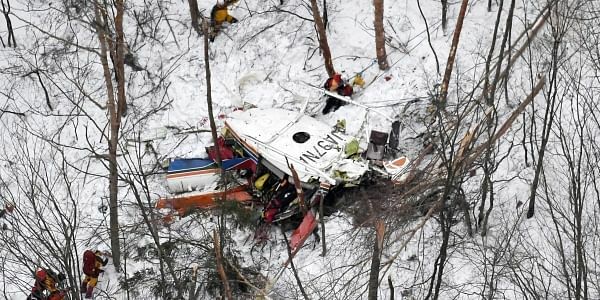 TOKYO: vJapanese authorities confirmed Monday that all nine people aboard a rescue helicopter that crashed in snow-covered mountains in central Japan have been pronounced dead. The Fire and Disaster Management Agency said in a statement that the nine men — seven firefighters, an engineer and the pilot — were aboard a rescue helicopter that crashed during a training flight Sunday. The helicopter, belonging to Nagano prefecture's rescue unit, crashed on the side of Mount Hachibuse, about 250 kilometers (150 miles) northwest of Tokyo. TV footage showed the mangled aircraft buried in deep snow, sitting belly-up with its broken pieces scattered around. Japanese public broadcaster NHK said the helicopter is a 15-seat Bell 420EP made by Bell Helicopter, based in Fort Worth, Texas.